1 DARK Tuner + 1 non-Tuner Beast-Type monster. If this card attacks, your opponent cannot activate any Spell or Trap Cards until the end of the Damage Step. 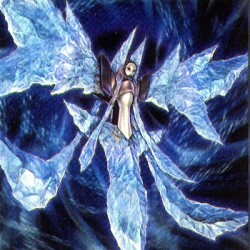 When this card is destroyed by battle and s..
1 DARK Tuner + 1 or more non-Tuner Fiend-Type monsters. Once per turn, you can activate this card's effect by removing from play 1 Level 6 or lower DARK Effect Monster from your Graveyard. Until the E..
1 DARK Tuner + 1 non-Tuner Insect-Type monster. If this card attacks, your opponent cannot activate any Spell or Trap Card until the end of the Damage Step. Once per turn, you can equip 1 face-up mons..
1 DARK Tuner + 1 non-Tuner Beast-Type monster. If this card attacks, your opponent cannot activate any Spell or Trap Cards until the end of the Damage Step. When an opponent's monster declares an atta..